Update: We released Blazor 0.5.1 to address several customer reported issues. If you have already installed Blazor 0.5.0 please update to the 0.5.1 patch (release notes). Blazor 0.5.0 is now available! This release explores scenarios where Blazor is run in a separate process from the rendering process. Specifically, Blazor 0.5.0 enables the option to run Blazor on the server and then handle all UI interactions over a SignalR connection. This release also adds some very early support for debugging your Blazor .NET code in the browser! A full list of the changes in this release can be found in the Blazor 0.5.0 release notes. Install Visual Studio 2017 (15.7 or later) with the ASP.NET and web development workload selected. Blazor is principally a client-side web framework intended to run in a browser where the component logic and DOM interactions all happen in the same process. However, Blazor was built to be flexible enough to handle scenarios where the Blazor app runs apart from the rendering process. 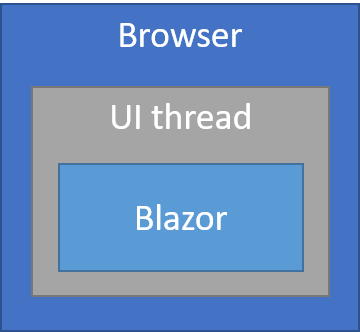 For example, you might run Blazor in a Web Worker thread so that it runs separately from the UI thread. Events would get pushed from the UI thread to the Blazor worker thread, and Blazor would push UI updates to the UI thread as needed. This scenario isn’t supported yet, but it’s something Blazor was designed to handle. Another potential use case for running Blazor in a separate process is writing desktop applications with Electron. The Blazor component logic could run in a normal .NET Core process, while the UI updates are handled in the Electron rendering process. We have a working prototype that you can try out of using Blazor with Electron in this way. You can still write your entire app with .NET and C# using the Blazor component model. Your app still has a rich interactive feel and avoids unnecessary page refreshes. Your app download size is significantly smaller and the initial app load time is much faster. 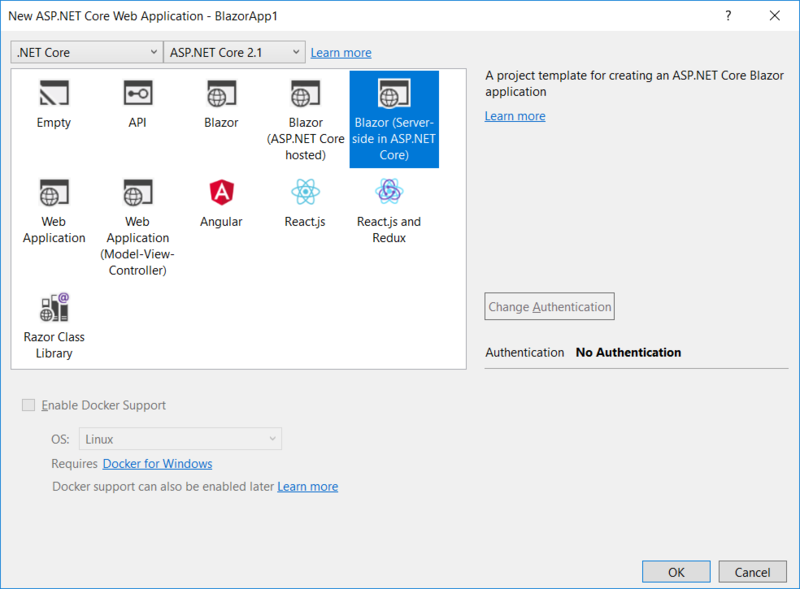 Your Blazor component logic can take full advantage of server capabilities including using any .NET Core compatible APIs. Because you’re running on .NET Core on the server existing .NET tooling, like debugging, just works. Works with thin clients (ex browsers that don’t support WebAssembly, resource constrained devices, etc.). Latency: every user interaction now involves a network hop. No offline support: if the client connection goes down the app stops working. Scalability: the server must manage multiple client connections and handle client state. While our primary goal for Blazor remains to provide a rich client-side web development experience, enough developers expressed interest in the server-side model that we decided to experiment with it. And because server-side Blazor uses the exact same component model as running Blazor on the client, it is well aligned with our client-side efforts. To create your first server-side Blazor app use the new server-side Blazor project template. You can also create a server-side Blazor app from Visual Studio. When you run the Blazor server-side app it looks like a normal Blazor app, but the download size is significantly smaller (under 100KB), because there is no need to download a .NET runtime, the app assembly, or any of its dependencies. You’re also free to run the app under the debugger (F5) as all the .NET logic is running on .NET Core on the server. The template creates a solution with two projects: an ASP.NET Core host project, and a project for your server-side Blazor app. In a future release we hope to merge these two projects into one, but for now the separation is necessary due to the differences in the Blazor compilation model. The server-side Blazor app contains all of your component logic, but instead of running client-side in the browser the logic is run server-side in the ASP.NET Core host application. 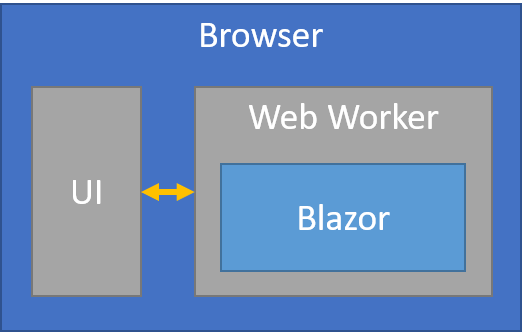 The Blazor app uses a different bootstrapping script (blazor.server.js instead of blazor.webassembly.js), which establishes a SignalR connection with the server and handles applying UI updates and forwarding events. Otherwise the Blazor programming model is the same. The WeatherForecastService in the template generates the forecast data in memory, but it could just as easily pull the data from a database using EF Core, or use other server resources. All Blazor projects in 0.5.0 now use a new startup model that is similar to the startup model in ASP.NET Core. Each Blazor project has a Startup class with a ConfigureServices method for configuring the services for your Blazor app, and a Configure method for configuring the root components of the application. The app entry point in Program.cs creates a Blazor host that is configured to use the Startup class. While the server-side Blazor project may also have a Program class, it is not used when running on the server. However it would be used if you switched to client-side (WebAssembly) execution just by changing the <script> tag in index.html to load blazor.webassembly.js instead of blazor.server.js. The Blazor app and the ASP.NET Core app share the same service provider. Services added in either ConfigureServices methods are visible to both apps. Scoped services are scoped to the client connection. When running Blazor on the server the UI state is all managed server-side. The initial state is established with the client connects to the server and is maintained in memory as the user interacts with the app. If the client connection is lost then the server-side app state will be lost, unless it is otherwise persisted and restored by the app. For example, you could maintain your app state in an AppState class that you serialize into session state periodically and then initialize the app state from session state when it is available. While this process is currently completely manual in the future we hope to make server-side state management easier and more integrated. In previous Blazor releases the project build modified index.html to replace the blazor-boot script tag with a real script tag that handled downloading the starting up the runtime. This setup made it difficult to use Blazor in arbitrary HTML files. In Blazor 0.5.0 this mechanism has been replaced. For client-side projects add a script tag that references the _framework/blazor.webassembly.js script (which is generated as part of the build). For server-side projects you reference _framework/blazor.server.js. You can add this script to any HTML file, including server generated content. For example, instead of using the static index.html file from the Blazor client project you could add a Razor Page to your ASP.NET Core host project and then add the Blazor script tag there along with any server-side rendering logic. Blazor normally renders strings using DOM text nodes, which means that any markup they may contain will be ignored and treated as literal text. This new feature lets you render special MarkupString values that will be parsed as HTML or SVG and then inserted into the DOM. WARNING: Rendering raw HTML constructed from any untrusted source is a major security risk! Use the MarkupString type to add blocks of static HTML content. Thanks to a community contribution from Benjamin Vertonghen (vertonghenb) we now have a Visual Studio snippet for adding component parameters. Just type para and then hit Tab twice to add a parameter to your component. Blazor 0.5.0 introduces some very basic debugging support in Chrome for client-side Blazor apps running on WebAssembly. While this initial debugging support is very limited and unpolished it does show the basic debugging infrastructure coming together. 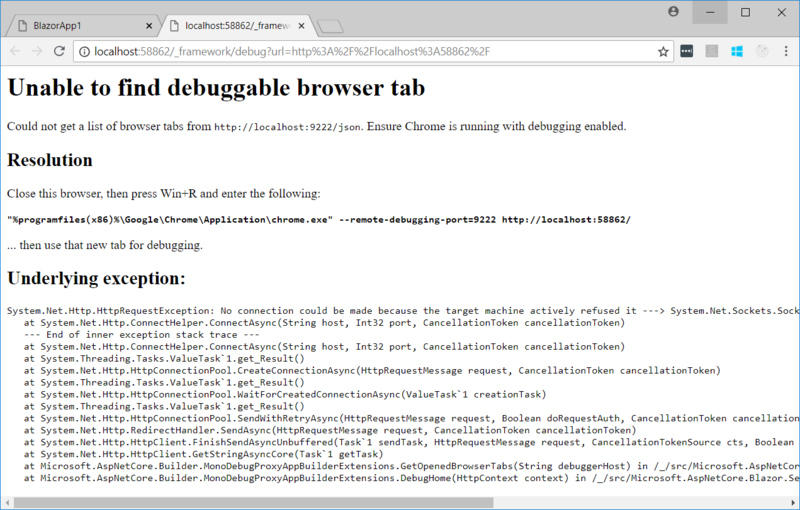 You need to run Chrome with remote debugging enabled to debug your Blazor app. If you don’t, you will get an error page with instructions for running Chrome with the debugging port open so that the Blazor debugging proxy can connect to it. You will need to close all Chrome instances and then restart Chrome as instructed. Once you have Chrome running with remote debugging enabled, hitting the debugging hotkey will open a new debugger tab. After a brief moment the Sources tab will show a list of the .NET assemblies in the app. You can expand each assembly and find the .cs/.cshtml source files you want to debug. You can then set breakpoints, switch back to your app’s tab, and cause the breakpoints to be hit. You can then single-step (F10) or resume (F8). How does this work? Blazor provides a debugging proxy that implements the Chrome DevTools Protocol and augments the protocol with .NET specific information. When you hit the debugging hotkey, Blazor points the Chrome DevTools at the proxy, which in turn connects to the browser window you are trying to debug (hence the need for enabling remote debugging). You might be wondering why we don’t just use browser source maps. Source maps allow the browser to map compiled files back to their original source files. However, Blazor does not map C# directly to JS/WASM (at least not yet). Instead, Blazor does IL interpretation within the browser, so source maps are not relevant. That’s it! 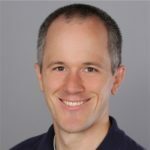 You cannot step into child methods (i.e., F11), observe the values of any locals that aren’t an int/string/bool, observe the values of any class properties or fields, hover over variables to see their values, evaluate expressions in the console, step across async calls, or do basically anything else. Our friends on the Mono team have done some great work tackling some of the hardest technical problems to enable source viewing, breakpoints, and stepping, but please be patient as completing the long tail of debugger features remains a significant ongoing task. The Blazor community has produced a number of great Blazor extensions, libraries, sample apps, articles, and videos. You can find out about these community projects on the Blazor Community page. Recent additions include a Blazor SignalR client, Redux integration, and various community authored samples (Toss, Clock, Chat). If you have a Blazor related project that you’d like to share on the community page let us know by sending us a pull request to the Blazor.Docs repo.